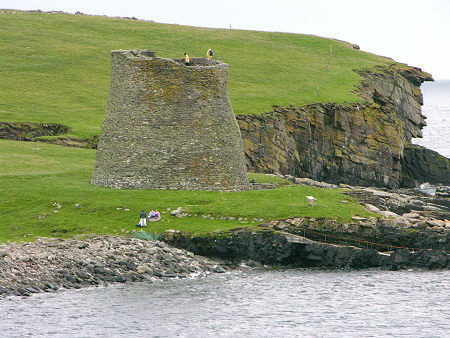 The Broch of Mousa is an Iron Age building in Shetland that was called Moseyjar-borg by the Norse. It appears twice in the sagas. The first notice occurs in the Saga of Egill Skallagrimson, which refers to a period c.900AD. It states that Bjorn Brynulfson, fleeing from Norway with Thora Roald’s daughter, because her father would not agree to the marriage, was shipwrecked on Mousa. They celebrated their marriage in it, living there over the winter. The second notice occurs in Orkneyinga Saga, when Jarl Erlend Ungi fled from Orkney with Margaret, the widow of Maddad, Earl of Atholl, and was besieged in the broch by Jarl Harald Maddadson, who disliked the idea of having Erlend as a step-father. The neat top storey at Mousa is a mid-19th century creation. In the late 1850s there wer5e fears that the broch was going to fall down, and the Society of Antiquaries of Scotland started a subscription so that repairs could be made. In 1861 a Shetland mason called Gifford Laurenson made major changes to the top of the building, which have stood the test of time.